Square shape megaphone is a unique way to state any custom message. Made of 14 pt. board stock with the outside liquid laminated for a high gloss finish. Makes a great holder! 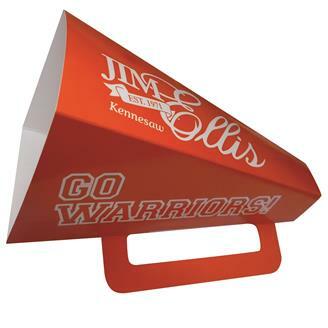 Perfect for pep rally's, sporting events, conventions and more. USA made. Quick turn, just ask! PMS Color Match : $15.00(V) per color. Offset printed standard ink no charge. Size : Square 9" Megaphone.